Hawaii’s Democrats elected lobbyist Kealii Lopez as their new chairwoman for the next two years Sunday, dealing a blow to the more liberal or “progressive” wing of the party. Star-Advertiser. 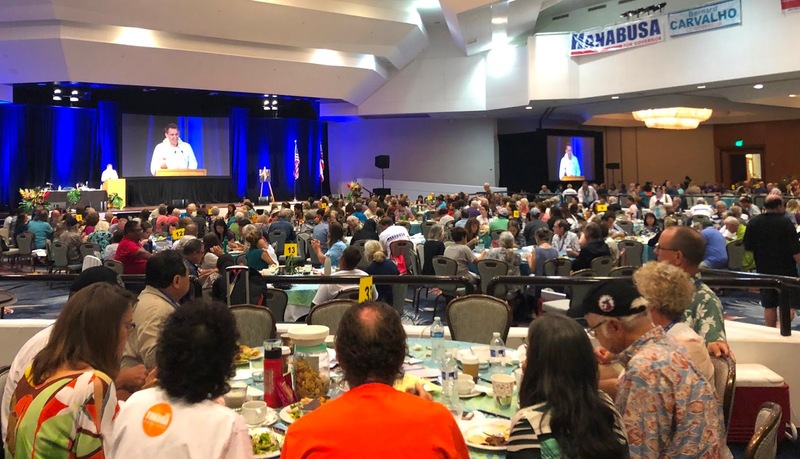 Hawaii’s Future Is At Stake, Hanabusa Tells State Democratic Convention. On the event’s second and final day, delegates replace chairman Tim Vandeveer with Kealii Lopez. Civil Beat. Ige Takes Shots At Trump To Fire Up Audience At Democratic Convention. Facing an uphill battle for re-election, the governor repeatedly stated, “We can be proud as Democrats,” as two-day event began. Civil Beat. The U.S. Department of Health and Human Services will award more than $3 million to medical training and early childhood development programs on Oahu and Maui. Pacific Business News. The developer of Kapiolani Residence held a topping-off ceremony for its $200 million, 45-story condominium at 1631 Kapiolani Blvd. as it took another step closer to delivering 292 affordable units to expectant owners. Star-Advertiser. Crews continue to repair an 8 inch pipe in Pearl City that caused a water main break around 2 p.m. Monday. KITV. A fast-moving lava flow was advancing on several streets in the Leilani Estates subdivision on Monday night, just a day after lava destroyed at least 10 homes in the area, Hawaii County Civil Defense officials said. Hawaii News Now. One day after emergency personnel raced door to door Sunday night telling residents in a Hawaii island community about an onrush of lava, the county’s disaster management boss delivered a new message for people who refused to heed a previous call to get out. That message on Monday: Please be more prepared to flee at any moment’s notice. Star-Advertiser. The county’s Civil Defense chief said despite a door-to-door effort Sunday night to warn Leilani Estates residents to evacuate immediately during a lava threat that ended up destroying 10 homes, not all were receptive. Tribune-Herald. Lava from Fissure 8 is advancing on Nohea and Kupono Streets north of Leilani Street, and there is a lava fountain on Moku Street. Anyone in the area, from Pomaikai east, needs to leave now, civil defense says. Big Island Video News. Kilauea volcano on Hawaii's Big Island has had it all over the past three weeks: molten rock shooting toward the sky, lava oozing from the ground and ash clouds rising miles into the air. You can also add "vog" to the mix. Associated Press. Halemaumau Crater has grown exponentially, from 12 acres just a few weeks ago to more than 90 acres today. KHON2. As dramatic changes are occurring on the floor of Halemaumau crater, and as explosive events are expected to continue, scientists are learning more about the activity at the summit of Kilauea Volcano. Big Island Video News. USGS scientists relocate to UH Hilo as summit explosions continue. KHON2. Hawaii County’s Fire Department is one of the key first responder organizations working overtime in lower Puna. Hawaii Public Radio. Lanipuna Gardens resident claims being stranded for almost 12 days, surrounded by lava. KITV. Relief is on the way for Big Island residents irked by the accumulation of abandoned vehicles along rural roadways. West Hawaii Today. A 280-acre light industrial and commercial park in Pulehunui that the state Department of Land and Natural Resources hopes will generate revenue for its programs is moving forward, after the project’s draft environmental impact statement was released last week. Maui News. State Representative Troy Hashimoto will host a Lawmakers Listen town hall meeting on Tuesday, May 29, from 5:30 to 7 p.m. at Iao Intermediate School in room J-204 for the residents of District 8 (Wailuku, Waipaku, Waihee), and any other interested community members. Maui Now. The County of Maui Real Property Assessment Division recently won the prestigious International Association of Assessing Officers Certificate of Excellence in Assessment Administration. Maui News. The state is moving forward on plans to limit the number of daily visitors to the popular Haena State Park on Kauai’s north shore. Star-Advertiser. Farmers on Kauai say the state should brace for a shortage of its taro crop after record-breaking rains flooded their fields. Associated Press.